Metalworkers rejoice! The Engineering’s Thermal Anvil is ready for use. 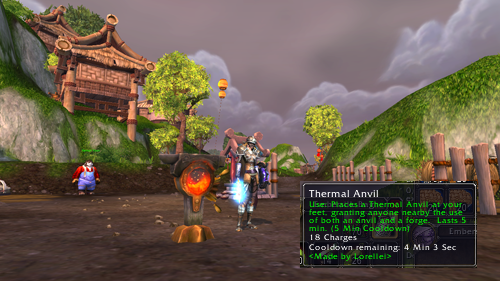 Thermal Anvil being used on the farm. Yes it has charges, so it’s not permanent. But you don’t have to run around trying to find an anvil to craft with. You can just drop one and use it where ever you are. 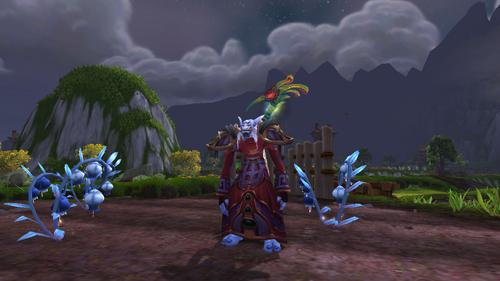 I think farming (The Halfhill/Tillers rep version as opposed to Gathering) is going to be really big. Once you’ve earned enough reputation with the Tillers you can buy special seeds. When these seeds mature they give you crafting materials. El has an excellent guide here. Not only that Songbell seeds grow up and give you Motes of Harmony. When you combine 10 of them you get a Spirit of Harmony ,one of the crafting items needed to craft high level items. Think of them like Chaos Orbs. Songbell plants fully grown and ready to be harvested. So with a total of 16 plots I can harvest 1.6 Spirits of Harmony per day. I’m only averaging 1 per day from doing daily quests.